At the front, the traditional Volvo V-shaped bonnet incorporates a grille with a wide chrome surround and three-dimensional mesh inserts, plus a large Volvo 'iron mark' badge. The front bumper has a degree of colour-coding and an extended skidplate built into it. The Volvo XC90 is also distinguished by 18in alloy wheels (standard on SE and SE Lux) and colour-coded side mouldings, door handles and wheelarch mouldings with black stone protectors. In line with the rest of the Volvo range, the Volvo XC90 also features large, body-coloured door mirrors, which incorporate the side indicator lights. The muscularity of the Volvo XC90 is matched by rounded corners front and rear, a gently sloping (split) tailgate and shorter roof section to promote a smoother, non-aggressive impression and help the vehicle to look more compact and desirable. The Volvo XC90's 'cockpit forward design' enables the passenger compartment to be as far forward as possible with a more steeply raked windscreen than in most other SUVs. 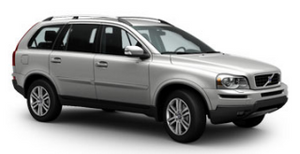 This has allowed Volvo to make a seven-seat SUV within modest overall body dimensions. The Volvo XC90's tailgate is gently sloping rather than vertical to clearly state that this is not a regular Volvo estate car. The resulting shorter roofline also helps the vehicle appear smaller and gives it a sporty stance. For added convenience, the tailgate is split so the lower section can be used as a seat or table; it is strong enough to be stood upon when loading items onto the roof, and the upper section is not too large, heavy or high when opened.